The name Duesenberg was very well known in the 1920’s and 30’s as one of the most luxurious and fastest automobiles of the era. The Duesnberg Automobile Company was start in St. Paul Minnesota in 1913 by two brothers, August and Frederick Duesenberg and their primary focus was on race cars and high end luxury automobiles. Without a doubt the most popular cars built by Duesenberg would have been the J series and its many different variants built from 1928-1937. It was designed by Fred to be the most luxurious and powerful car on the road and to compete with the top of the line Mercedes Benz. It featured an incredible 265hp “straight eight” engine that was significantly more powerful than anything else on the road. 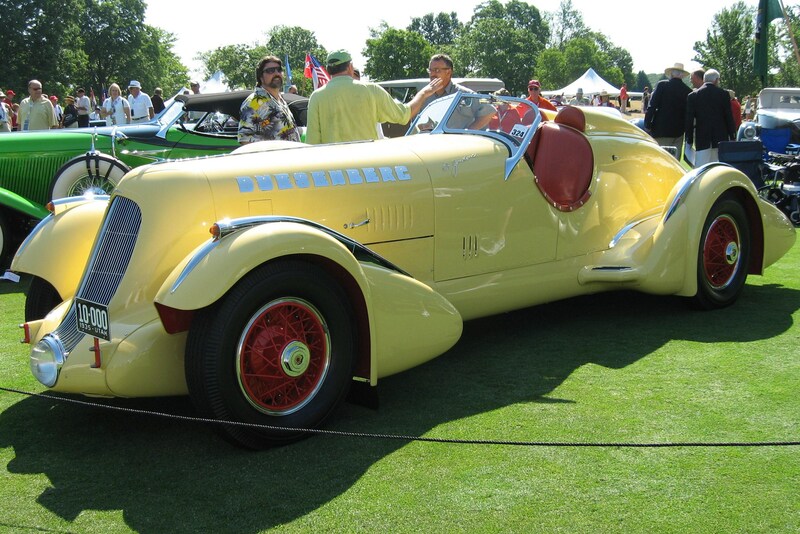 In 1932 there was a SJ edition released that had a supercharged version of the straight eight that reportedly had 320hp but only 36 were built. Even more rare were the Special Bodied models that that had more powerful engines and all kinds of unique body work. One Particular Duesenberg special was built for speed freak Ab Jenkins with one goal in mind, become the fastest car on the road. It featured a 420 cubic inch supercharged motor that apparently put out over 400hp and could hit 104mph in second gear. 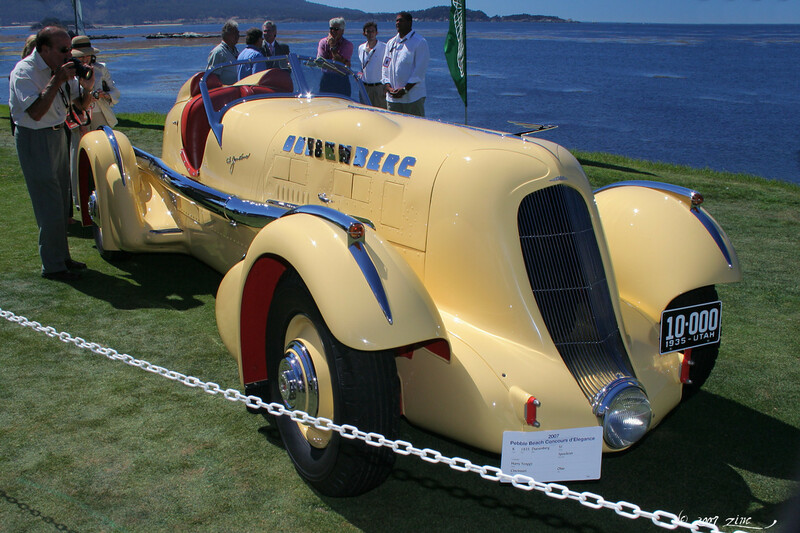 Ab Jenkins planed on using the car to beat as many speed records as he could, and in 1935 he would set his first by maintaining an average speed of 153.97 mph for a solid hour at track on the Bonneville Salt Flats. Jenkins would go on to set many of these endurance speed races showing the reliability of the “duesy”. 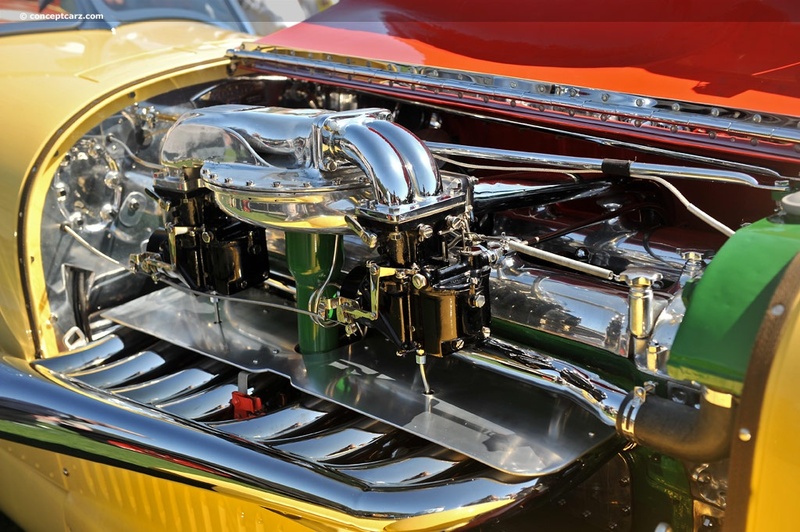 Once Jenkins and his son, Marvin got the speed bug they decided to place a large V12 Curtis Conqueror Airplane Engine that reportedly had 750hp! The Mormon Meteor was born. In 1936 he would set a 310 mile record at 164.47mph and then set a 48hr record with an average of 148.64mph with use of a second driver. When you stop and think about that for a minute you realize just how impressive that is. The equivalent in modern time would be a Hennesey Venom GT running at top speed for 48 straight hours! Now all of these records were set at the Bonneville Salt Flats and I have to assume that they made a track large enough that the huge Mormon Meteor could make the turn at a constant speed. It was not uncommon for these cars to weigh over 6,000lbs, which is more than a full size pickup truck, so that is a lot of weight to get moving. 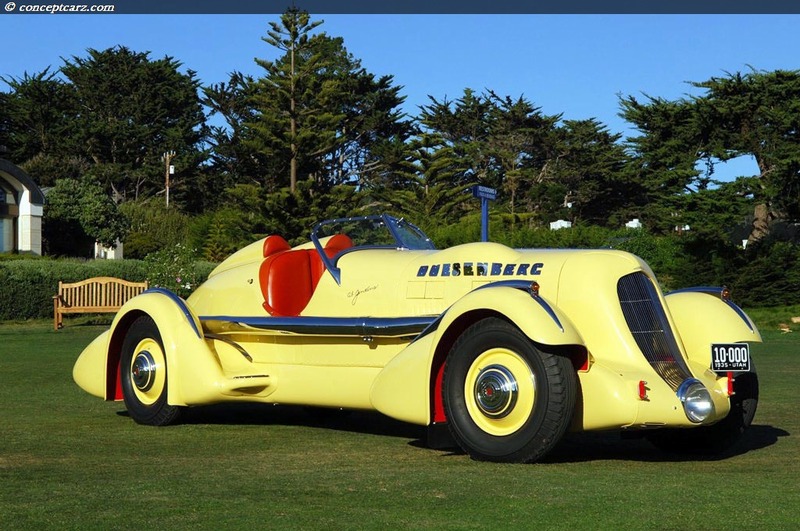 Because the massive airplane engine put out so much power and the rest of the car was basically a stock Duesenberg it was extremely difficult to drive the Mormon Meteor at high speeds and the back end would slide out, commonly known as oversteer. 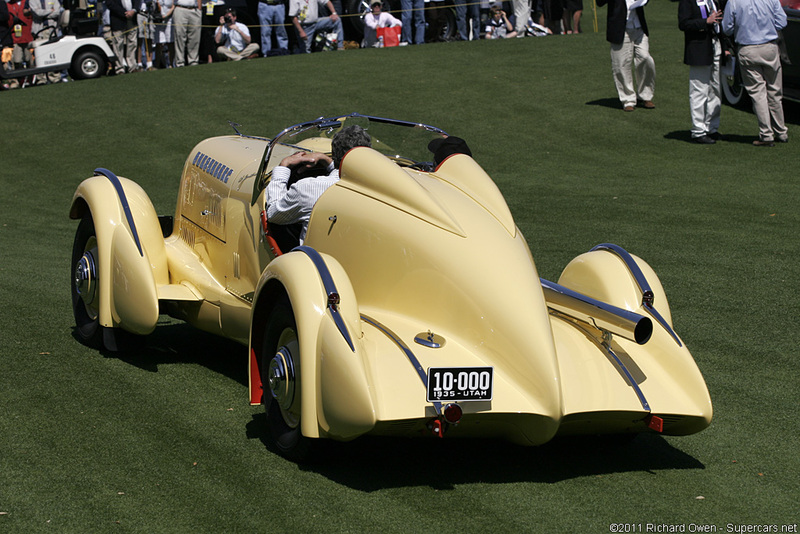 So in 1938 it was decided that the big V12 would be taken out and put into car that was designed to handle that much power that would later be called the Mormon Meteor 3. Ab and his son would restore the car back to its original Duesenberg Special condition and would drive the car on the road for over 20,000 miles until 1943. It would later fall into the hands of a family in 1959 that would keep it in the street driving condition until 2004 when they would sell it at none other than the Pebble Beach Auction. However the new owner decided it needed to go back to its heritage and be in the 1935 race condition. 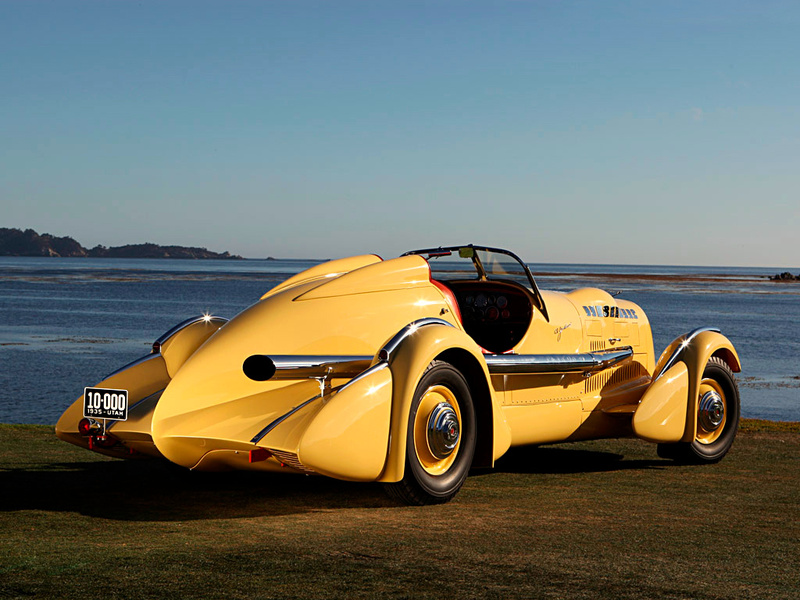 After a long, and most likely ridiculously expensive restoration process the car was entered into the Granddaddy of car shows, The 2007 Pebble Beach Concourse d’Elegance and not only was the car accepted into the show but it even took home the top honors that year.